In the wild, these orchids are found in tropical and subtropical parts of the world. You should provide a temperature around 80 degrees Fahrenheit during the day. The temperature should be much cooler at night. Try to keep it between 50 and 65. These plants are quite hardy, so they can survive exposure to temperature extremes for a short period of time. Cymbidium orchids like to consume a lot of water and stay moist. Therefore, you should water them frequently. Make sure you drench the pot thoroughly. This is especially important during active growth from March until October. During the cooler months, you can keep the pot a little less wet. 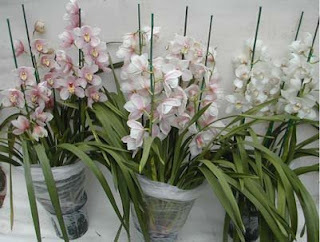 Cymbidiums should be given liquid fertilizer twice a month from January to July. During the darker and cooler winter months, you should feed them less and keep them slightly drier. From August to December, you should only fertilize the plant once a month. Cymbidium orchids bloom best when kept in their pot. Therefore, you shouldn't disturb the plant too much. You should only repot when the pseudo-bulbs are up against the edge of the pot. You should wait to repot after the plant has bloomed. After you have successfully repotted the orchid, you should water it lightly. These orchids usually grow best when kept outdoors for most of the year. You should give them as much light as possible. However, never expose them to intense direct sunlight as that can burn the leaves. When given the right amount of light, the plant's leaves will be light green and firm.